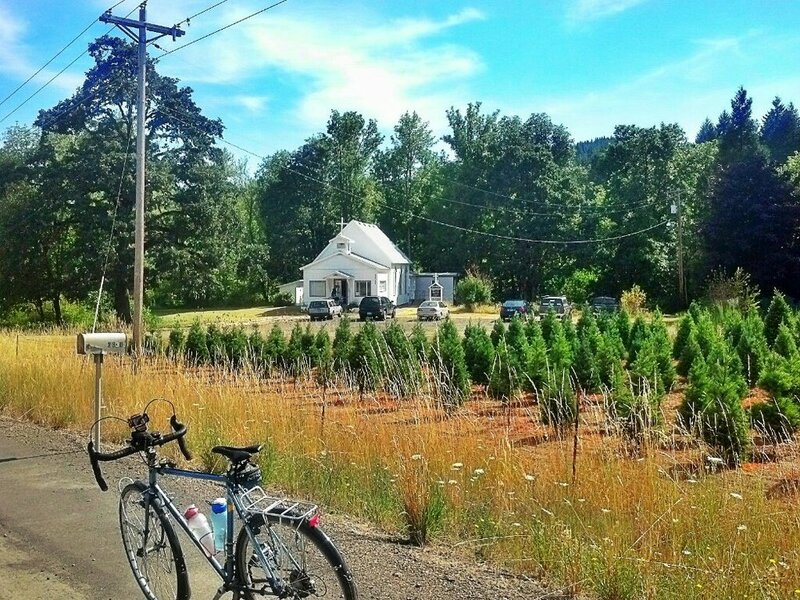 Third day riding the same loop, Timberhill, down to Philomath via West Hills, then south on Fern to Llewellyn, over to connect with Decker, back on 34 to Grange Hall, then Chapel Drive and back up to Timberhill. Yesterday I saw folks heading into the little church on Westwood Creek. I watch as a man and woman carry a baby in its little car seat. I think of the community, why most people go to church. I think of the indoctrination the baby will ultimately receive, creating beliefs which will be hard to dispel later in life. I know discipline is the cure for the indolent, chaotic life I’ve been living.Lack of discipline is why it is seems hard to move against the inertia. So I ride, again. Riding hard. Pushing myself, go Ocean go! I notice the shift. Legs are stronger, pace faster. Bridge Pedal is less than a week away! James and Gail have already signed up. Will I be ready? Will they leave me in the dust?